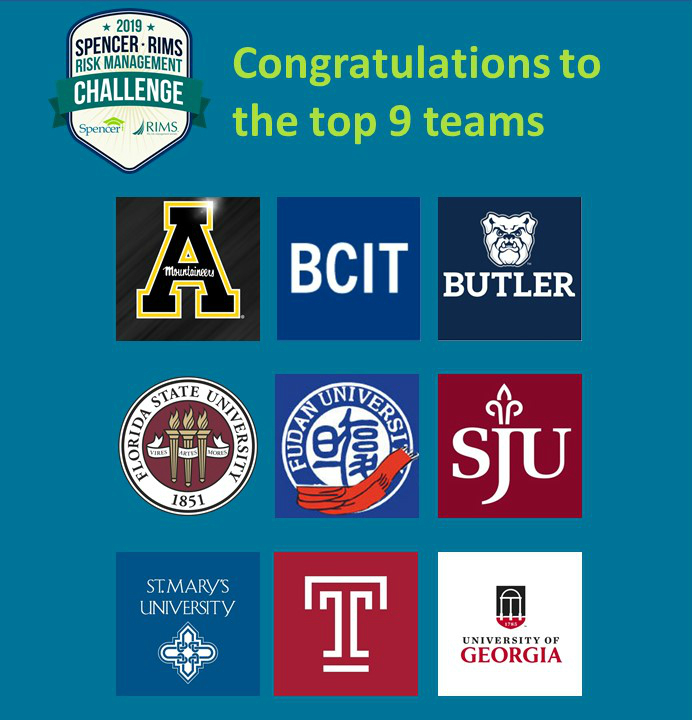 Spencer is a proud supporter of the 2019 Spencer/RIMS Risk Management Challenge, and we would like to congratulate the top nine teams that will be traveling to the 2019 RIMS Annual Conference & Exhibition in Boston to present their findings before a panel of distinguished industry judges. The nine teams are from (in alphabetical order): Appalachian State University, BCIT, Butler University, Florida State University, Fudan University, St. Joseph’s University, St. Mary’s University, Temple University and the University of Georgia. To reach this stage in the competition, teams submitted a written paper on a case study. This year the case study involves IKEA. After each team makes its presentation on Sunday, the top three team will be identified and will present in a public session on Monday, April 29. The winner will be announced at the Spencer reception Monday evening. The Foundation began its 40th anniversary celebration in the city where it was established — Atlanta. The Atlanta RIMS Chapter’s Education Conference served as the venue for the foundation to begin celebrating 40 years of funding the education of industry leaders. Joining the celebration were Robert Spencer’s widow, Charlotte Spencer, and their daughter, Libby Swinson. Founding board member Jim Newton and his wife Judy also attended. A reception also was held for local alumni. The Atlanta chapter made a $25,000 contribution to Spencer. Over time, the chapter has contributed more than $500,000 to the foundation. The Chapter has established two named scholarships and has supported the foundation’s ongoing programs. Foundation Chairperson Marya Propis with Spencer alumna Sunmi Hirata and LaKenya Young. Celebrating Spencer’s 40th anniversary: Spencer alumni Paulus Ackah (far left), Julia Hellman (third on left) and Sunmi Hirata (far right) talk with Charlotte Spencer, Jim Newton, Judy Newton and Libby Swinson at a reception the night before the luncheon. Spencer awards undergraduate scholarships in the amount of $5,000 and Master and pre-dissertation scholarships in the amount of $10,000. Among the criteria students must meet are: they must be a full-time student for the full 2019-2020 academic year; have major or minor in risk management, insurance, actuarial science, business/finance; and have a GPA at or above 3.3. The full list of criteria can be found at https://www.spencered.org/students/scholarships/. Completed applications are due by January 31, 2019. The Doctoral Candidate Scholarship application will follow a slightly different schedule – opening in November, with a deadline of March 1, 2019. The Foundation will only be awarding 40 grants for 2019. Risk managers interested in applying for this grant should read the criteria. Applications must be completed by January 9, 2019. Established in 1979, the Spencer Educational Foundation changes lives and propels careers by awarding scholarships, facilitating internship opportunities, providing a Risk-Manager-in-Residence program to universities, and awarding grants to help promote the industry to the next generation. For more information, visit www.spencered.org. July 9, 2018 (NEW YORK) – Spencer, the premier foundation supporting risk management and insurance education, awarded scholarships to 12 industry professionals who are seeking master’s degrees part-time. Each recipient was granted up to $10,000; a total of $101,100 was awarded. Combined with its full-time scholarships, the Foundation awarded 82 scholarships this year totaling $501,000. Since its inception, the Foundation has given out more than 1,050 scholarships. Twane Duckworth received the RIMS Part-time Master’s Scholarship, and Sandra Del Guercio received the New York Chapter Part-time Master’s Scholarship. Both RIMS and the RIMS New York Chapter provided funds to establish scholarships to further the education of risk management professionals. Spencer Scholars are selected through a rigorous and competitive process. Criteria for evaluation include field of study, career objective, work experience, leadership skills and academic performance. Applications for the Foundation’s Part-time Master’s Scholarships will be available on the Foundation’s website (www.spencered.org) in January, 2019.